With a new moon on the rise, that means it’s almost time to celebrate the Chinese New Year or Spring Festival! Unlike the Gregorian calendar we are used to, the Lunar New Year date is determined by the new moon that cycles in the time between the end of January and the middle of February, which would make this year’s new year land on February 5th. It’s also one of the world’s largest celebrated festivals, lasting 15 days and ending on February 19th with the Lantern Festival. The end of this lunar cycle marks the beginning of the Year of the Pig! Similar to the twelve celestial zodiac bodies you’re used to reading about in your horoscope, the Chinese zodiac is based on a yearly cycle and said to represent twelve different personality types. 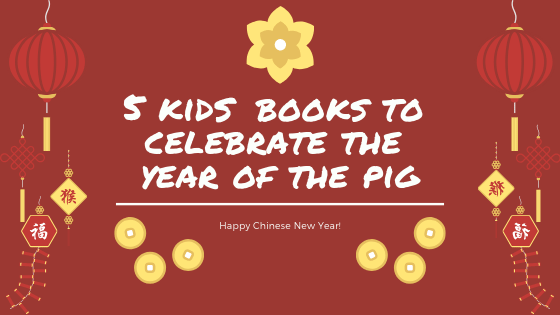 The pig represents a compassionate trait while symbolizing wealth in Chinese culture. People born in the Year of the Pig are focused, gentle and optimistic. However, be warned all my little piggies, this also marks the beginning of your unlucky year. But, don’t worry, the color red is your biggest defense against unluckiness and you won’t have to deal with this for another twelve years. To celebrate all the enthusiast pigs out there, here are five children’s books celebrating this year’s animal all-star to help you reminisce and for all the younger little piglets to enjoy! I honestly dare you to find someone that doesn’t enjoy this heartwarming children’s classic. Little Wilbur was born the runt of his litter. Fern, the little girl that caretook him from birth, thought of him as a pet. When Wilbur is sold to Fern’s uncle to be raised for slaughter, he makes his only friend in Charlotte, the spider that lives above his pen. Fearing for his future, Charlotte implements a plan to save Wilbur, making him a tourist attraction and cherished by his new owner. This is a story of friendship, life, and death. I’m not crying, you’re crying. The Olivia series by Ian Falconer is a favorite read at Bookmans Midtown’s story time (everything Thursday morning at 10 AM)! Based on his real family, Olivia is an overactive and hyper little pig who loves to try out new things. She loves dressing up, going to the beach, and dancing and dreams about having even more fun when she goes to sleep. But, what makes Olivia stick out the most are it’s mostly black and white illustrations with splashes of red. You may know what happens when you Give a Mouse a Cookie but do you know the consequences of giving a pig a pancake? This fun and silly story takes its reader through the chaos and demands of what happens when you give your pet pig a pancake. More importantly, it teaches a valuable lesson: that maple syrup is a must. If you thought you knew the story of the three little pigs, guess again. This was a personal childhood favorite of mine. Following the account of his side of the true story, Alexander T. Wolf attempts to explain what really happened when he met these piggies. He was just trying to borrow some sugar, really! This is a witty and possibly not all that reliable retelling of the classic story. Got any other pig books you want to share? Tell us below!